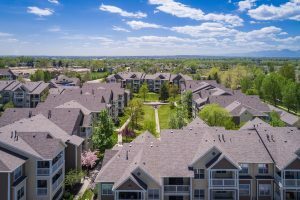 LONGMONT — The Stonebridge at Twin Peaks apartment community on Ninth Avenue in Longmont has sold for $44.2 million. The deal closed Wednesday, according to a news release from CBRE, which represented the sellers. Stonebridge at Twin Peaks recently sold for $44.2 million. Courtesy CBRE. Des Moines, Iowa. They were represented by CBRE’s Dan Woodward, David Potarf, Matthew Barnett and Jake Young. Boulder County public records list the buyer as Scandic Longmont LLC. That company is registered to an Incline Village, Nev., address. Built in 1998, Stonebridge at Twin Peaks is a garden-style community consisting of 172 one-, two- and three-bedroom apartments across seven buildings on nearly 11 acres. Occupancy at the time of sale was 95.9 percent, according to CBRE.